A collaborative effort between Seagate Technology and Newisys is claimed to have produced "the industry’s fastest flash storage design". A combination of Seagate SAS SSDs and Newisys sever modules in a single 42U rack achieved block I/O performance of 1TB/s with 5PB of storage. Brett Pemble, VP and GM of flash products, Seagate, described the collaborative feat as producing "one of the highest storage densities ever achieved in the industry". Pemble said that the lessons learned from working with Newisys held the potential for breakthroughs in storage performance. Where microseconds matter in the processing of massive amounts of data, such a fast system could be highly valuable. Examples of applications that could benefit include those used by financial markets, oil and gas, and weather prediction. Eugene McCabe, EVP of the Newisys product division at Sanmina, said that "This solution takes advantage of what high-performance SSDs can offer without sacrificing space, power, cooling or redundancy". McCabe added that crossing the 1TB/s threshold in a single rack was a major milestone. The industry leading 42U rack server, as created by the pair of technology firms, used 21 Newisys NSS-2601 with dual NSS-HWxEA Storage Server Modules (single or dual-Xeon powered). Each Newisys NSS-2601 enclosure supports 60x 2.5-inch SAS drives and is capable of offering 49GB/s bandwidth. 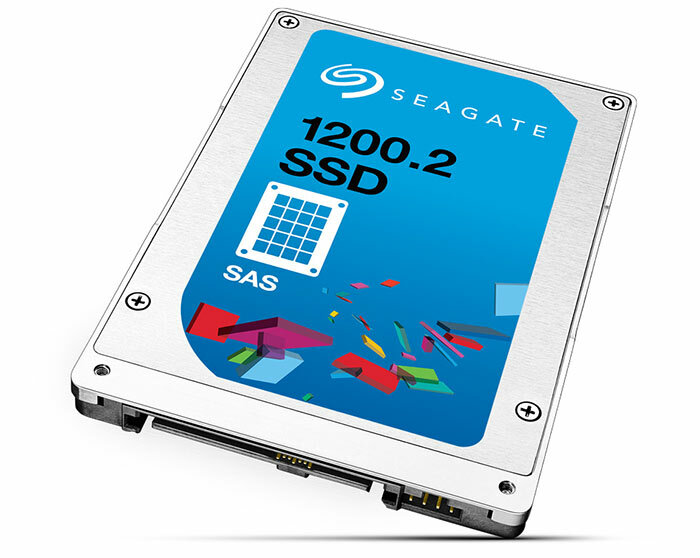 Seagate's 1200.2 SAS SSD, as deployed and pictured above, is said to be the first 12Gb/s SAS device to optimize dual-channel throughput with up to 1900MB/s sequential reads. Can YOUR SSD run Crysis? Without a CPU or graphics card? Can your KETTLE run Crysis? Doesn't sound like YOU can run Crysis. They picked a terrible name for their division with all that is going on with terrorism.